ACDC Management Series …Learn from a Shop Owner that made plenty of mistakes and was successful. 1. The ON ramp … starting a new business The 4 Ps… Defining and making a plan for success. Starting a new auto repair business? Want to know more about making yours better? The 4 Ps… Defining and making a plan for success. ACDC was a repair shop for over 25 years. 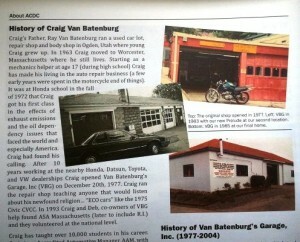 Craig (your trainer) started the shop in the picture at age 26. Many years later a training company across the street. Wisdom come with age. 2. Employee relations ..creating an employee manual .. conflict resolution. Employee relations ..creating an employee manual .. conflict resolution and a lot more. This is a tough business. ACDC can make it smoother. ACDC has emplyees. We still have issues and they get resolved. Ask your questions in this live interactive class. 3. Selling Service and Preventive Maintenance or how to double your average work order. Selling Service and Preventive Maintenance or how to double your average work order is a must. This was the first class ACDC ever taught (back in 1997). Simple and to the point and updated to the digital world. 4. Doing the numbers .. keeping track of your goals. The not so fun stuff but it is vital. This boring subject will be fun when Craig teaches it. 5. Effective marketing .. winking in the dark will not get you a date. It is all about the web. Yes, the mail still works. Many tips given. 6. Information access .. where are the answers to those tough diagnostics. What about “Right to Repair in Massachusetts”. I live in Mass so learn where the country is headed. 7. Where will your next Tech come from? How will we continue to get the techs we need to replace those we loose and grow more? This thought provoking class may make you rethink what you are doing now. This is a NEW Class. 8. The Off Ramp .. saying goodbye and making a new life. I did and and learned a lot (some of it the hard way). This class was taught at a hotel in Worcester, MA (my town) to a dozen shop owners. Here is a piece of it.